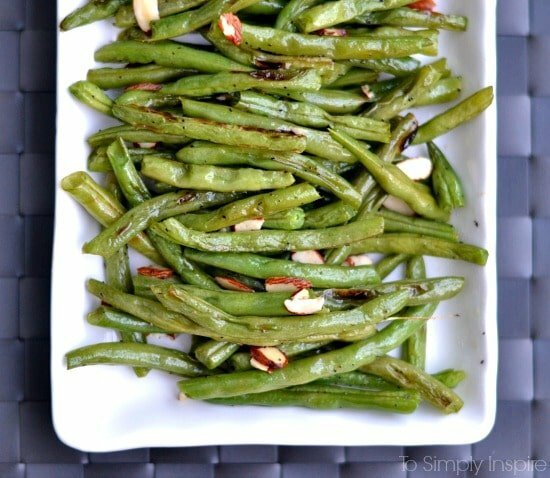 These Roasted Green Beans are so simple and delicious with added sliced almonds. Add them to any meal as a limitless healthy side. I have snapped my share of green beans in my life. It was a typical thing to do at my Grandparents house before any family meal. Come to think of it, my own children have never snapped a bean in their lives. Hmmm, I must do something about this. I sometimes think I am failing at carrying on my Southern traditions with my kids (even though I know that other areas snap beans too). My kids don’t like collard greens or turnip greens, which I was eating by the bowlful by age 5. I’m pretty sure I had no choice to eat several foods growing up or I would have starved! But I do get a little kick out of the reactions when I serve these certain somethings to my family. My son, at least, loves green beans. My daughter? Well, we are working on her. I will keep trying different variations. She did like these roasted green beans SO much better than just steamed or boiled. Yay! So, if you happen to have a child like me that challenges you with their “green” eating, give these a try and they may be surprised. There is something about the flavor that roasting gives them. Plus the added almonds make them extra special. Snap the ends off of green beans. Place green beans in a bowl and add other ingredients. Place on lined baking sheet in a single layer. Bake for 12- 15 minutes, stirring once halfway. Sprinkle with sliced almonds the last 5 minutes of baking. These roasted green beans are so simple and delicious. Add them to any meal as a limitless healthy side. Hi Sherri, Thanks for sharing at the party! Pinned for later. Hope to see you again this week. Have a great weekend. I’m confused. Is it supposed to be 1/4 teaspoon of pepper and a 1/4 teaspoon of salt? Or is it 1/2 teaspoon of pepper? Well, that was silly of me 🙂 It is 1/4 tsp of each. Less if you prefer, of course. 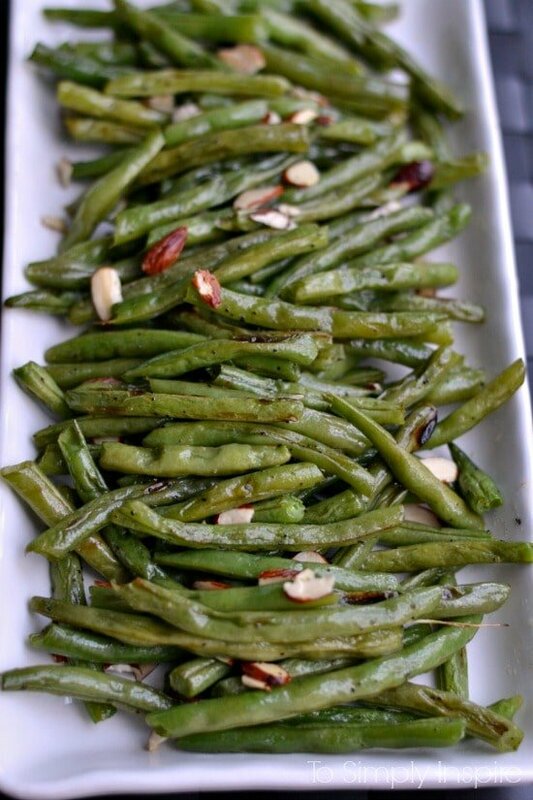 Roasted green beans looks delicious, thanks for sharing with Hearth and soul blog hop. pinning. These look so good! I remember snapping beans from the garden as a kid…these days, though, I slice them with a knife by the handful, haha! Green beans are a favorite veggie! These look delicious! I haven’t bought fresh green beans in quite a while, and haven’t had a garden in a while too, but this year I have a small garden and I even found a place to plant a package of green beans, hoping to can some this year but I will definitely have to try these. They look so good. I remember helping my parents snap green beans when I was little, but I don’t think my girls have ever snapped any either. Thanks for sharing! Pinning! This looks simple & yummy! Pinning it. 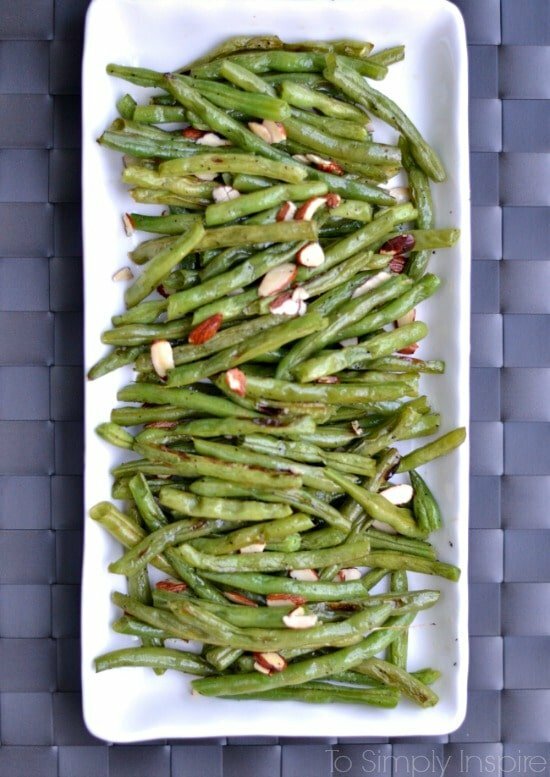 I love green beans and will definitely have to try this recipe! These look so good! I love how simple the recipe sounds! Thanks for sharing! Pinning and sharing! 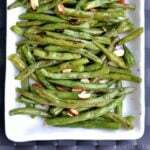 These look delicious- green beans are always a hit in our home, even with my extra-picky husband! I’m always looking for new recipes to try- thanks for sharing! I stopped by from Tuesdays at Our Home.